Even if you don’t have a lot of outdoor space, you can still make the most of what you have. Citronella candles and tiki torches are stylish and practical lighting choices. Not only do they provide some extra light, but they repel bugs too. Throw in some seating options such as bean bag chairs, a small table, and a few conventional chairs and you have a perfect place to entertain. There really is no age limit on hot tubs and spas. Plus, most bachelor pads have at least one of these amenities. Make sure you have the space first. A spa or hot tub isn’t going to be appealing if you can only get one person at a time onto your balcony to use it. Make sure you have plenty of towels. Throw in a little mood lighting and you’re all set. It’s not just because that’s where the “magic” happens. If you think about it, you probably spend a lot of your time there. Add some chairs and a small table to create a comfortable seating area. This can be a good place for you to relax and unwind at the end of the day. You should have some sort of color scheme going on. The mix-matched style was fine in the dorm, but not here. Popular bachelor favorites include basic dark patterns and stripes. You can find a decent and affordable selection at stores like Target and Walmart or online through eBay or Amazon. A huge 60 inch TV taking up half of the wall may be impressive, but it also tends to scream “I value my possessions more than anything else.” The same is true with your stereo or sound system. Keep it simple and make sure any wires are hidden. Only pick a few “toys” that you want in your apartment. If you’re going to go with a pool table, you don’t really need a large gaming center with Playstation, Xbox, and two other gaming platforms all set up and ready for you to get to the next level. The goal is to make your bachelor pad a transition time–not to make sure you stay a bachelor forever. 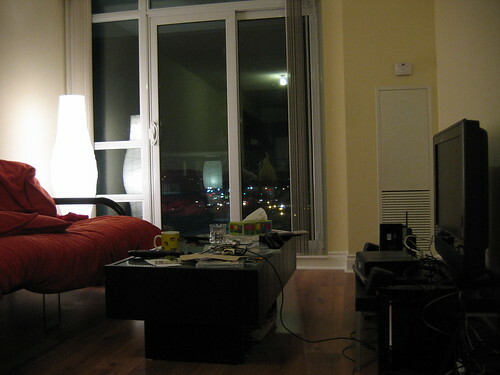 A messy apartment isn’t all that appealing to your guests, especially those you want to stay overnight. Put storage space such as shelves and cabinets where you need it most, which is usually the bedroom. Aside from actual closet space, you can add storage space by using boxes and drawers under your bed or adding shelves and baskets to your closet. You want to make sure everything is kept clean. Even if you don’t use the kitchen that much, you’re not going to score you any points when your date finds leftover pizza stuck to the counter while reaching for a wine glass. A bachelor pad is really your first chance to establish your own style. You want a place that is attractive for select visitors, but still expresses your personality. Keep the entertainment selections to a minimum, make use of storage space to eliminate clutter, make the bedroom a place to sleep and relax, and pick a basic theme or color scheme and go with it. Now you have the perfect bachelor pad. Enjoy it while it lasts! Allen Sims is a freelance blogger who writes on behalf of personalhomeloanmortgages.com. This site can help you secure a good mortgage rate, so you can afford the bachelor pad that you have always wanted.